Excellent shape. The bird love it as soon as I put it up which was so easy. I am very happy with this Nyjer seed feeder. It not only holds a lot of the seeds, it accommodates a LOT of birds. I counted 14 goldfinches on it one day, and the other side of the feeder wasn't even within my range of vision. 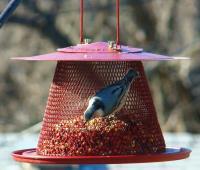 The feeder was exactly what was pictured and the birds really do hang on to the side! They flock to the feeder and we enjoy trying to count them all. Our record is 18 yellow finches at one time!!! I did not get instructions on how to fill it so I am having a hard time filling the feeder. I cannot not keep Sparrows away. I am having trouble filling this feeder. I am having trouble with Sparrows invading this feeder and scaring off the finches.